Want to participate? It's free! Please send your name and U.S. terrestrial mailing address here. Home of Richard Pachter's Biz Books Club. I found this to be another of those books I could not put down once I started reading. I read the book from cover to cover in one sitting. I found this book to be an easy ready and it kept my attention throughout. The author makes some very practical suggestions on how to deal with "busy." The author makes a very interesting point right up front that "things have changed but we have not." We still think and operate as if "busy" is the only way to be successful. We go day after day chasing e mails, phone calls, texts, and meetings. We never stop or slow down to allow ourselves any "brain rest." We are always on GO! But in the final analysis busy is an addiction that will not generate success. All too many of us are overwhelmed but we let that stress push us to work harder not smarter. We hear lots about the ability to multitask. NOT if you want to be successful! It is a recipe to FAILURE! The author makes it clear he want to change the way we think about busy. He says rather than bragging about being busy, he wants us to feel at least slightly embarrassed. He suggests the opposite of busy-sustained, focused attention. The point is made that our brains are not made for constant business. In fact, a study out of the University of London reveals that busy lowers our IQ. Our brains have limited processing power at any given time. So we must choose to do what is more important and leave the rest of the stuff go. And Time Management is not helping! In fact, it is making things worse. The author shares and suggests we learn how to divide things into inputs and outputs. Inputs are the things that come to us. Outputs are what we actually do. So the author says the key to success is MASTERY-what we choose to do or not do. We are cautioned about mindlessness. We just do things because they are in front of us but not the best things for us to do. 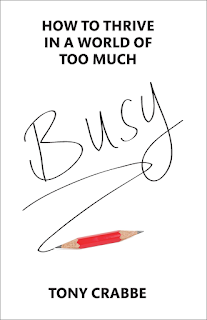 I found it quite interesting how the author says "busyness is like a buffet table." We just keep, piling stuff on our plates, more than we can ever eat. We must come to the point where we say "enough is enough." We must recognize the relationship between the quality of the stuff we do and busyness. We must learn that it is not about rushing around and being impatient. It is about focusing our attention on the important and letting the other stuff go. I won't repeat it hear but the section on "Maintaining Attention," pages 52-56, is a MUST read for busy people. One of the things we find hard to do as busy people is to say NO! Read pages 70-76 for some practical helps. The authors says we have to stop being so productive and become more strategic. We have to stop, playing the "more game." While productivity does have advantages, it will not keep us ahead for the long run. -Learn that less is more. -Do the big stuff first. -We must build our brand. -We must walk our own path. -Learn to manage emotions and build confidence. -Get away from more and put values first. -Develop a few good friends. More is not better! -Work towards affinity, not popularity. -Learn that enjoyment is a performance enhancer. -We must develop and have the joy of commitment. -Learn that boredom is OK! -Allow yourself to have some "Happy Attacks." -Finally, we must make our good intentions stick. This was a comfortable and relevant read because I hate being so busy! Life is going by too quickly to be constantly busy, and contrary to common thought Tony Crabbe says ‘time management’ is not the cure. I so welcomed his opinion of time management saying it may make us more efficient but less effective a feeling I have long embraced and now can proclaim! In our present world where the number of friends on Facebook is an achievement I salute his idea of fewer friends, but cultivating true friendships. As a senior I look back on friendships of many years. I enjoy frequent contact with close friends far more than hours spent connecting on Facebook. Today Branding is so important, and I found this book to be helpful in finding a clear and simple brand. And then living up to it. What I didn’t like about the book was the multitude of quotes. Crabbe lists 3 pages of authors from which he drew his arguments and developed his ideas, and 13 pages of notes for the many quotes. It seemed every thought or argument was supported by a quote, documented by one of these authors. It was so frequent that I found it distracting. I deeply enjoy reading the book. Usually, when I read a business book, I think that may be the book can be summarized in a nice business magazine article without losing any content. With this book, I feel in the same way, but the difference was that the book is not about just one main topic, which you can condense in one article, you will need at least 3 or 4 articles to cover the interesting topics discussed in the books. And this exactly, what it makes the book word of reading. The book is not a pure business book, I consider that it is more a business, plus self-help, psychology and new age book. It has like an holistic approach, which makes it especially relevant nowadays. As opposed to other books where messages are sometimes lofty and ethereal, this book is very practical, with direct impact on the way to do things. It might not be as hands on as “getting things done” but to my taste is far more understandable and applicable to a wide range of human situations. I find it funny that being a physician making life and death decisions in matter of seconds, I find myself being “good busy” at work, but somehow out of the cocoon of the operating room, I find myself many times scattered, pulled and distracted. We are busy because we want the spotlight, because we can’t disengage, because we are open 24/7. We are busy busy because we don’t want to pay attention. We are busy because we just can’t commit to what’s important. We are busy because it’s easier to say yes than no. The book was really good and gave great strategies for getting rid of the busy work that is getting in the way of being productive. This would really be good for people that can control some or most of the things that get in the way. Unfortunately, in the corporate world, you can’t really say you won’t do these things. Especially if those things are part of your job responsibilities. There are however some great strategies that everyone can use, regardless of what your job responsibilities are. One thing I did like about the book was how it summarized each chapter in a way that allowed you to try some or all of the concepts. That way, you could try and implement a few things at a time and see what works best for you. Anyone who follows this book club by definition multitasks and is wrapped up in "Busy" activities. Tony Crabbe has a message for us SLOW DOWN smell the roses, and dig deep into a limited selected topic or two. This will make you personally and professionally more efficient and knowledgeable and valuable to your work and family. Focus , Specialize and differentiate yourself, develop new ideas and concepts by sharpening your attention at work and with your family and circle of friends and supporters. I finally got out of Facebook, now I'm less busy, and more happy! How is that for a nod of approval for Tony Crabbe's How to Thrive in a World of Too Much. How to thrive? It's all in there: stop managing your time, stop being productive, stop justifying busy, stop having so many friends! Time management ruined it for us because what it taught us, unintentionally or not, was to multi-task. Everybody got on to this treadmill where they thought, "as long as I keep busy, everything will be OK." We turned "flow" into panic. And it wasn't long before all of us, including children started to "tune out" in order to cope. Or not. This book instruct us, do not say time is money, say time is opportunity. The opportunity to make an impact, a must in this global economy, weighs more heavily than productivity as it does not take the place of differentiation. Consider it. It reminded me a little bit of Arianna Huffington's book Thrive where she introduces the concept of “Third Metric of Success." In the same vein as Crabbe's definition of success, she is aware about money and power being the two the traditional two metrics, but highlights well-being, wisdom, wonder and community giving as the components of a third metric essential for thriving. If you have ever wondered why the most popular time management techniques don't seem to work for you, Busy may be just the help you need. Rooted in psychological and change theory and grounded in scientific evidence, the information presented in this work can leave you both inspired and depressed. You will be given many explanations as to why you may have been unsuccessful in accomplishing your "want to's" in life and many suggestions on methodologies to improve both your professional accomplishments and your personal relationships. Without sounding overly statistical, Busy supports its theories with examples of studies or people who demonstrate what it proposes. The reader is introduced to three essential elements to moving beyond busy: mastery, differentiation, and engagement. The author assists the readers in looking at themselves and making decisions that can impact them both professionally and personally. Each chapter includes a summary of the "Big Message" in case you didn't catch it and some "Go-Do" action steps and things to "Experiment." The concepts are practical and doable and really make a lot of sense. I was shocked to learn that I couldn't name my "15" key relationships. Tony Crabbe tells us how to avoid being too busy! The answer is to develop a plan to become more efficient with a positive attitude toward life. Efficiency is the answer for a less stressful, easier personal life and for a better business plan. Crabbe presents a plan thoroughly explaining the best course of action using a positive attitude. He uses examples of both failures and successes. Put in writing on paper (yes, writing) the most important things to focus on for the day. Now choose 3 ! Write down the 3 most important activities in priority order on a post - it note and stick it where you can see it all day long. Before turning on the computer or doing anything else, start working on # 1. It is about attention, not time. One thing at a time. Avoid distractions. Realize you can't do or have everything! Know it is all right to say no! Enough is enough!!!! Optimize your time by taking advantage of time stuck in traffic to listen to language learning tapes for example. Performance is what matters. Put your values first, have clear goals, think positive, remembering that less is more. Too much often results in failure. The lyrics to the song "Accentuate the Positive" by Johnny Mercer/Harold Arlen summarize Tony Crabbe's book perfectly! "Accentuate the positive, eliminate the negative and don't mess with mister in-between, along with the rest of the words make a perfect summary! Everything is perfectly clear and makes sense. The book is filled with plenty of examples of methods of replacing productivity and use thinking, creativity, and attention to create a large picture. Busy is constantly being defined as a work goal of achievement. The book is divided into three sections Mastery, Differentiation and Engagement. Mastery defined as the present conditions of Busy. Differentiation defined as success. Engagement for defining happiness. The book makes an interesting read and has a wide variety of ideas and concepts to choose from and apply in our lives. This is a great business psychology book. Overdosed on advice as to how I can cram more productivity into my hectic days, I was reluctant to take on another volume on the subject. I put my cynicism aside, plunged into “Busy,” and found a horse of an entirely different color. Here was an author spreading the gospel of doing less, not more. Within a few pages I was hooked. After a few chapters, I had done more highlighting, underlining and corner-folding than I have done in my last 10 business books combined. All this in an attempt to hold on to the message of less in a world that keeps asking for more. As the owner of a creative business, and a resident of the 21st century, I flit from task to text to email to meeting, checking items off my to-do list with intensity and fervor. All this gear-shifting creates inefficiency. “Busy” suggests a different approach. Ignore those emails. Undo that to-do list. Make choices and focus on the things that are important, and get to the small stuff during designated bursts. Pursue depth and real relationships instead of the buzz of busyness. This book presents an interesting thesis: improving time management will increase production, but ultimately reduces quality of life and the quality of your output! We are all having to deal with ever increasing streams of input, whether it is email, social media updates or excessive business meetings for those in middle management. We are so BUSY dealing with the torrents of information coming at us, that we struggle to find time to process all of the information, and have little or no time to get the most important things done. Crabbe’s reasoning is supported by psychology principals (psychology majors will love this business book), and each section gives great practical tips that define the problem, and then offer practical real life ‘experiments’ to implement to help move from managing information to actually thinking about and engaging in solutions to problems. This is actually productive, and allows us to achieve a much more fulfilling existence. Interesting book that I thought was another Time Management book…surprise…it's a book that says its okay to manage your attention to what you are doing now and not how to manage your time. In other words, it is okay say no to projects and other tasks in order to concentrate on finishing your current project. It is okay to base your career not on productivity but by considering success on what matters, and how to put these changes into effect. The four sections of BUSY - Mastery, Differentiation, Engagement and Momentum show readers how to manage attention not time. The author shows the reader how to develop a new approach to taking back their life. It does seem like we have all been overwhelmed by the disease of “busy-ness”, especially since the Internet came hugely popular. Our professional and social lives and are ever more and more consumed by a world of “too much”. This book guides us toward becoming healthier, happier and successful as human beings. It presents research and best practices along with interesting stories and strategies to help the reader truly thrive in today’s busy world. “How are you doing?” is usually followed by the response “busy” at some point. All around the world people seem over-whelmed; exhausted; in the face of the machine. We keep up, our technology, but we keep falling behind. It is no longer possible to do it all, or to get on top: there is too much to do. All time management does is is splinter time into smaller fragments; we cram and squeeze activity into every second of our day; we stay busy, but in doing so, we stop thinking and breathing. So, time management becomes the problem, not the solution! Having people “work hard” seemed to be the biggest management challenge! Now in some cases that problem is solved; almost everyone works hard. But we still play the “more game”. We assume if we produce more than others, if we respond more quickly, we will succeed or be more of a success. We probably will not since we cannot put our full effort to making “all” our projects excellent. In fact, all this “productivity” can be seen as a weak substitute for genuine impact and differentiation; the things that matter in the information age. Busy is self-defeating. We tell ourselves that we are busy so we can succeed, either for our loved ones or for our happiness. But as we get caught up in this “busyness”, we tend to disconnect from relationships and activities that probably matter more to us. As we disconnect we damage the very relationships and happiness we are trying to improve. Stop having so many friends! Busy was an enjoyable read. It details that no matter how occupied we might be in our lives, there is always a way to simplify it. He talks about how it's not enough to just think it, you have to actually change your behavior. This can involve not just our work schedules but our home life, too. It is important to make wise choices to get the most out of our day. Confidence is a big plus in trying to accomplish this. The author breaks this down in simple tables. This book is written for busy people! At the end of each chapter there is an overview of the material covered "The Big Messages" as well as homework to put in practice what we just learned: "Go-Do", very useful for those that only browse through books. Tony Crabbe discusses the importance of focus, prioritization, problem solving and innovation. The "less is more" philosophy is the theme throughout the book. The target audience is career minded employees, but the chapter about branding (ch. 7) has excellent application for the self-employed and business owners as well. The "What I have learned" chapter is excellent, because we can see that this book is not theoretical, but empirical. It gives us a glimpse of how the author practiced what he is trying to teach us. As someone who is guilty of being busy all the time, I was forced to rethink my lifestyle when I read How to Thrive In A World of Too Much Busy. In his book, author Tony Crabbe wakes us up to the reality that many of us are pushing ourselves, driving ourselves to be always on when the body and brain aren't designed for it. Rather than just point out the problem, Crabbe offers solutions. Overall, his solutions are common sense. However, by using research to explain how and why we need to change our daily habits, Crabbe makes busting busy seem possible. Rather than fall into busy by default, Crabbe tells reader to make our primary driver for activity internal "what do I want to achieve?" He urges us to make tough choices with our time, set limits on too much, and to make time in our day for thinking. He also suggests we stop taking busyness so seriously and inject playfulness into our lives to feel less overwhelmed and more creative. At a time when distraction is rampant, managing attention has become a hot topic and Crabbe lays out an argument for changing our mindset by focusing on the moment or task at hand. When we get caught up in the relentless washing machine spin of fears and concerns, he wants us to immerse ourselves in a single task and allow ourselves to delay our worries for later. The goal is to maximize chunks of focused time, he asserts. Where other self-help books focus on time management, Crabbe goes deeper to urge us to think differently and examine our values as we navigate the endless quest for success by doing and acquiring more. Instead of striving for more, Crabbe tells us to focus on doing what we love and where we are strong. At the end of each section he gives readers a Go-Do box with steps to take to change our behavior. Making changes is hard work, especially when by being busy, we actually get to feel productive while procrastinating. Most of us need to figure out a better way to work and live and Crabbe gives us a new, well-thought-out approach to move us toward change. There is certainly a lot of books, articles, and videos on one or more aspects of time management. This book has taken a very unique approach while at the same time remaining true to some of the tactics and tools that have been around for decades. The best thing about this book from my perspective was the chapter on Managing Attention in the section of the book referred to as Mastery. The other sections were Differentiation and Engagement. The chapter on attention was one of the more unique approaches to self-help that I’ve read recently. I guess that I had just never thought about getting more done or juggling my time issues in that way. If you read that chapter carefully you will come away with a greater appreciation for managing your focus as a most helpful approach for getting things done. I have often felt myself working mentally with 2 or 3 things at the same time. I think that I enjoyed the intellectual challenge. However, I have found myself recently missing the right brain file or putting in a file and losing it. I do write things down on sticky notes and the author would say that I a good idea. I also belong to a wonderful national charitable organization, and our “Gala” was scheduled for this past month. We have a relatively small lodge – just about 50 members – and even smaller volunteer staff of workers. This year, for various reasons, we had even less than the small amount making preparations and following through with preparation, participation, and follow-up of the “Gala.” Well – things HAD to be done, and HAD to be done in a certain way, at a certain time… and, all of a sudden, I was thrust into what I had managed to avoid for the past two years – a world of Too Much Busy! “Busy” reaffirmed that we all can handle only so many things well before we start mishandling things – getting sloppy, getting irritated, getting sick (including “sick and tired”), and so on. I like the way Crabbe busted busy-ness. In his Preface (as with every chapter of his book), he presented a concept and then gave concrete examples of why he said what he said, backing it up with real-life instances and examples. I found myself agreeing with everything he had to say and loving the way he presented his concepts. I actually feel he helped me make it through some of our last-month crises by reminding me that it doesn’t have to be this way the next time – that there are actions to be taken to survive the world of too much busy. Copyright 2015 The Pachter Family Trust. All rights reserved. Don't void where prohibited.